Camouflage is among the basics in the military. It’s what makes a difference between a successful and an unsuccessful mission. A sniper ghillie suit helps to successfully monitor the enemy’s movements without being detected. In this review, we will show you the best sniper ghillie suit for the money. The Ghost Ghillie Suit from Arcturus is among the best camouflage suits available. This dry grass ghillie suit is made of lightweight and breathable material. There is also a woodland version available. This ghillie suit consists of a greenish pattern mixed with some light olive threads. The manufacturer has included a carrying bag and fireproof synthetic thread. 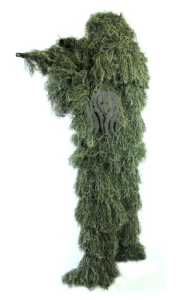 Check out the price of this ghillie suit here! The Ghillie Suit has a lot of threads which makes you become completely invisible when lying down. Its available in different colors. The elastic drawstrings and stitching of this sniper gear give users added comfort. This ghillie suit is lightweight and comes with a camouflage carrying bag. Check out this review of the ghillie suit (press play). The snap enclosures on the waist cover the entire body including the boots while the rifle wrap covers an average sized short gun or rifle without any problem. The Red Rock Gear Ghillie Suit is made of 98% polyester, 2% spandex and is available in Medium, Large and Extra Large sizes. The Red Rock Gear Ghillie Suit is very cheap and affordable for every type of user. 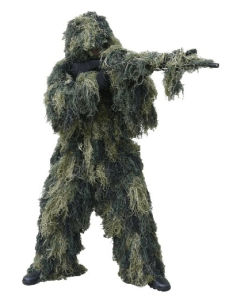 The inner shell of this cheap ghillie suit is composed of nylon netting which is not only lightweight but also shields the sniper from direct heat. The desert, snow and woodland camouflage makes this combat gear suitable to most vegetations and environments. This ghillie suit looks great and comes with different sizes for all types of users. The entire garment doesn’t fully cover the boots well when standing. This cheap ghillie suit is not made of top-notch polyester material. There are gaps in the material which may turn to be a weak point during combat. Check out this review of the Red rock Woodland sniper Ghillie suit (press play). These military ghillie suits are available in the market in various sizes, materials, and colors. Through reading this article, I believe that you’ve understood how to choose the best gear that will suit the environment. Through reviewing two of the best woodland ghillie suits, we find the “Arcturus Ghillie Suit” the best ghillie suit for the money due to its design and high-quality fabric which is durable and able to withstand adverse weather conditions. The green, black, tan, brown and unique dry grass colors make this combat gear ideal for desert and woodland use. The Red Rock ghillie suit is also a nice ghillie suit that is available in the market at a more affordable price. The suit is made of breathable polyester material which is lightweight and easy to stitch (repair). The best thing about this cheap ghillie suit is that it can be used as a woodland, snow, and desert ghillie suit at the same time. With this review at your disposal, it’s upon you to choose the best ghillie suit which you believe will suit your needs. With some of the cheapest options available in the market, don’t hesitate to maneuver around and make your purchase before you get spotted! There are two types of camouflages. These are the natural and artificial camouflages. 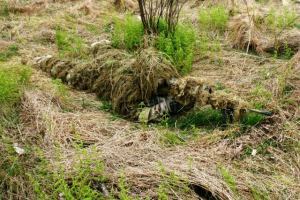 Natural camouflages include the native vegetation growing in a particular area where a sniper augments his appearance to avoid being noticed. On the other hand, artificial camouflage includes materials that are used to cover something to conceal it while in a mission. A good example of an artificial camouflage is a military or sniper ghillie suit which is mostly used to cover the sniper and his high caliber gun from being detected by the enemy. These ghillie suits can be used for quite some purposes like airsoft or in SHTF scenarios. Buying a ghillie suit is very easy since they’re the only standing artificial camouflages available in the market. They come in a variety of colors, styles, materials, and sizes making it overwhelming when choosing the right type. Nonetheless, there is nothing to worry about since this section will guide you on what to look for when choosing the right ghillie suit. How will the ghillie suit be used? It’s important to first consider your mobility and how you intend to use your woodland ghillie suit. If you intend to use it for paintball and airsoft games, choose a ghillie suit made of synthetic materials. This is because synthetic materials are lighter and compact than natural jute. If you’re using it to fully cover your body and your sniper gun, choose the best ghillie suit which provides full body camouflage. The two common types of materials used in stitching sniper ghillie suits are natural jute threads and the synthetic threads. Both materials work out well in all types of environments but the synthetic thread has more benefits as compared to the jute thread. They’re washable by hands, odorless, mildew and fire resistant and are non-allergenic. 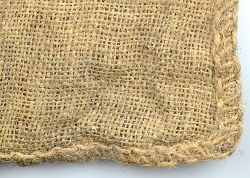 They’re also lightweight and more durable as compared to jute threads. Before purchasing your suit, consider the landscape where you intend to use it. You can purchase a desert ghillie suit if you intend to use it in semi-arid areas or a snow ghillie suit if you intend to use it in snowy environments. After noting down what ’s required to blend in, the next step is to review some of the top sniper ghillie suits to make your purchase. Since there are many options to choose from, this article will review some of the best woodland ghillie suits available in the market.